See all our past RideGuru city spotlight features below. Montreal is one of the most popular tourist destinations in Canada. As part of the province of Quebec, Montreal is a beautiful place to visit for many occasions. Montreal is one of the most bilingual cities both the province and country, with over 59% of the population able to speak both English and French. The city is known as a very nice, clean city to visit and live in-- it was named one of the most livable cities in the world. When planning your trip, make sure to check the weather beforehand. The city has a 4-climate season, but the winters are very cold! You may want to schedule a trip for late spring or early summer to get the most out of the trip (unless you like the snow, that is!). There is a lot to see in Montreal. Some even say it's like a piece of Europe placed in North America! Check out some of our top places to eat, drink, and visit! New Orleans is a city in Louisiana (you've probably read about it in a history book at one time!). The city is a great place to visit, unlike most populous cities in the United States. The culture in New Orleans, nicknamed "NOLA", is said to be different than the rest of the country. Not only does NOLA have delicious restaurants with all the southern food you know and love, it is also popular for being the birthplace of jazz music. As you can imagine, the jazz bars are a must see. When planning your trip, you also should schedule a tour to visit a plantation, which will give you a background on the history of the area. You may also know New Orleans as the place to go during Mardi Gras, the two-week celebration leading up to fat Tuesday. Las Vegas is popular for many reasons, and has been the setting for many major films in Hollywood. The city is known as "The Sin City" for all the reasons you may have assumed. It is sometimes referred to as the Gambling Capital of the World, with some of the largest and most populous casinos in the country. Vegas, as it's commonly referred to, is also a popular destination for entertainment and nightlife. Year after year, Las Vegas continues to be ranked as one of the world's most visited tourist destinations. The Las Vegas strip is where the majority of hotels and casinos are located, even though it is technically outside of city limits. Washington, D.C. is the capital of the United States of America and home to the White House. After winning the American Revolution against the British, the city was established and named after the first president of the U.S. and founding father, George Washington. 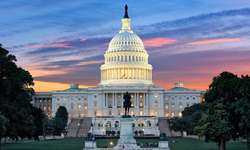 The city is where the United States Federal Government sits and is sometimes referred to as the political capital of the world. It's no surprise that D.C. happens to be one of the most visited cities in the world, housing over 20 million tourists per year. If you're visiting in the summer, expect a lot of humidity -- the city was built over what used to be a swamp! San Francisco is a popular tourist spot in Northern California where people visit from all over the world to witness the steep rolling hills, cool summers, and famous landmarks. 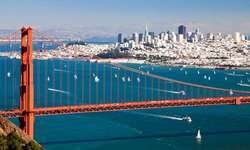 Some of the most popular spots are the Golden Gate Bridge, cable cars, and the formal Alcatraz Penitentiary. The city is the cultural, commercial, and financial center of the northern part of the state. Although not a likely a famous tourist spot, San Francisco is where you will find the headquarters for many technology companies including the infamous rideshare companies Uber and Lyft. If you're looking for a nice city to move, you may want to consider San Francisco as it was rated high in the world livability rankings, and has a per capita average income of over $100,000.